The Tracer 2 Overshirt is a newer version of the Tracer shirt we first added to our site about two years back. 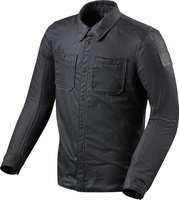 The Tracer 2 is a simply styled shirt style jacket with protective features for riding. It is perfect for those that don’t want a full-on riding jacket, and who want something that can be worn off the bike as easily as on. The material used for the Overshirt is a heavy duty canvas material that is made of cotton and Cordura. The Cordura is very abrasion resistant and being woven together with the cotton makes it a suitable material for riding where plain cotton doesn’t really have any abrasion resistant properties. The inside of the shirt is lined with a camo-print nylon. The styling of the Tracer 2 jacket is very similar to the previous version. The Tracer 2 goes with a solid dark blue material which has a neat tailored appearance. The shirt closes with a zipper (for safety) and then there is a snap closure setup for the placket over the zipper. The snaps look like buttons to give the shirt a more sturdy appearance (think lumberjacket shirt or Levi jacket perhaps). The last couple snaps don’t have the button look on the outside which the paint on your tank will be thankful for. Closing up this shirt is SO much easier than the “real” button closure on the original Tracer (one thing I griped about two years ago). If I had to guess, I’d say this is the one big feature change that prompted the issuance of the version “2”. The rubberized patch on the shoulder with REVIT’s logo velcros in place, so if you want to replace that with your own patch, you’ll be able to do that easily without sewing. Also, note the two strips of reflective material on the back sides of the elbows which will make you more visible at night. Also, the collar tips have small snaps to hold them down so they don’t flap and drive you crazy at higher speeds. REVIT says: The Tracer 2 combines 11oz. Cordura® denim with our slim SEESMART™ CE-level 1 protectors, making it a fashionable and safe riding overshirt. Furthermore, the tailored fit yet casual look makes the Tracer 2 a solid choice for urban riders. Adding to its effortless style is the button-up front, which cleverly hides the full-front zipper. The two bottom buttons are hidden behind the outer fabric, preventing the tank from getting scratched when riding. Then pair it with one of our jeans via the Safeway 2 belt since it has a short connection zipper around back.